Consistency is the key to being a winning kicker. To achieve, you need all the right ingredients. That’s what you’ll get in this program from one of the NFL’s shining stars. 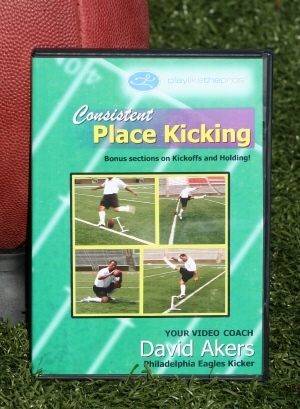 David Akers shows you his formula for success. Kicking Instruction by the most accurate kicker in pro football! the steps of the kick. how to kick from the hashes. You’ll also get bonus sections on Kickoffs and Holding! You’ll learn the In-Line Post Drill and the Goal-Line Target Drill. He covers kicking literally step-by-step showing you the Walk Back, Jab Step, Drive Step, Plant Step and the proper technique to achieve ankle lock at impact. Here’s what you need to know at impact. Here’s what you need to know to achieve the consistency that you’ll need to take your kicking to the next level. Entering the NFL in 1998, David has played with Atlanta, Washington, Philadelphia and Berlin Thunder of NFL Europe. He set Eagles’ records for season points leader, consecutive field goal, percentage and was a Pro Bowl alternative in 2000.